Supports up to 100 pounds, raises monitor for comfortable viewing. Stow keyboard underneath monitor riser for space-saving storage. Finished by Eco-friendly and sturdy bamboo board, natural and elegant look. 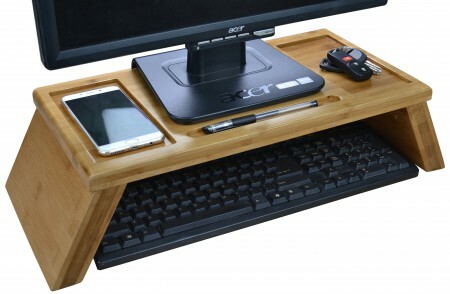 Keep your desk workspace organized. Full LIFETIME WARRANTY. 100% satisfaction guarantee. 100% worry-free guarantee.